From Linz, we will go first of all in direction of Mondsee, comfortably seated in our bus or minibus. We will go up the basilica of Mondsee to enjoy the beautiful view offered to us. We will continue our tour to Lake Wolfgangsee where we will drive along the banks of the lake from Sankt Gilgen to Sankt Wolfgang. Once in Sankt Wolfgang, we will visit the parish church where we will discover the famous altar Pacher and also the White Horse Inn which is world-wide famous thanks to the operetta called with the same name. Our next destination will be the spa city Bad Ischl where we will visit the emperor's house before having lunch in a typical place of the area of the Salzkammergut. Then, we will continue in direction of lake Traunsee where we will get on a boat and especially in the famous steamer "Gisela" which will bring us in the city of Gmunden, famous above all for its ceramic. 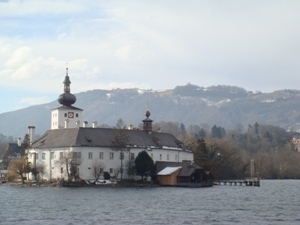 In Gmunden, we will admire the picturesque Orth castle and we will visit the ceramic factory. Finally, we will come back to Linz in bus or minibus where our tour will end. Our touristic programmes to the area of the Salzkammergut can be modified to fit your demands and individual interests. If you let us know your wishes and preferences for this excursion, we would be happy to establish a personalized offer and thus fit your desires. Linz Tours is a service presented by the tour operator City Tours, a company specialized in creation and organization of touristic sightseeing tours all around Austria. You will find some descriptions of excursions offered by Linz Tours in the buttons located to the left. You can get additional information on our partners and on Linz Tours and City Tours in the button entitled "legal notice".